Hey, Guys, we have great news for those scholars who want to build their career in Konkan Railway Department. Here, in this article, we are going to provide all the relevant information related to the Konkan Railway Recruitment 2018 in the below discussion of the post. Interested & hardworking candidates may read out this complete post & grab all the essential details and then you may apply online for the Konkan Railway Vacancy 2018 from the official website of Konkan Railway Department that is www.konkanrailway.com. For additional information regarding to the upcoming govt. jobs, admit card, result & answer key etc. candidates can bookmark our careerjobs360 website & grab all the latest news from here. Konkan Railway Department has published the official employment notification for Konkan Railway Vacancy 2018 for recruiting eligible and skilled aspirants for fill up 37 numbers of Sr. & Jr. Technical Assistant posts in the Konkan Railway department. Job Hunters who are searching for the latest government job in Konkan Railway then you may apply online for this KRCL Technical Assistant Notification 2018 from the official web portal of the Konkan Railway. Interested & talented individuals may submit their online application form on or before the due date which is 12th December 2018. Moreover, information regarding the KRCL Sr. Technical Assistant Recruitment 2018 such as academic qualification, age criteria, selection procedure, application charges, & how to apply is mentioned below in the article. Engineering Degree (BE / B.Tech) / Diploma / ITI with 2 years experience from university/Institute. Maximum Age Limit of the candidates is 30 Year Old. Upper age relaxation will be applicable for the reserved category of aspirants as per the government rules and regulations. Pay Scale: Shortlisted candidates will get handsome amount of pay band of Rs. 21,000 – 35,000/- Per Month. Selection Criteria: candidates can be selected on the basis of their performance in the various selection rounds which is going to be conducted by Konkan Railway. 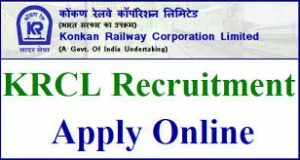 How to Apply online for Konkan Railway Senior Technical Assistant Recruitment 2018? Then, go to the notification section on the homepage and search out the Konkan Railway Jr. Technical Assistant Recruitment 2018 notification link. Then, Read the official notification for eligibility very carefully before applying for the post. After that, if you are eligible then you can fill the application with all the correct details in the given space. Upload the signature and recent passport size photograph in the application form. Attach all the required credentials with the application form. Remit the application form charges. Now, submit the application form by click on the submit tab icon.